What do you get when a multi-award winning 25-year old rapper and an 84 year-old billionaire energy tycoon has a Twitter exchange? You get more than 24,000 retweets. That’s what happened when Drake’s Tweet to his 7.4 million followers got upstaged by billionaire T. Boone Pickens of BP Capital who’s ranked as the 330th richest man in the world by Forbes. 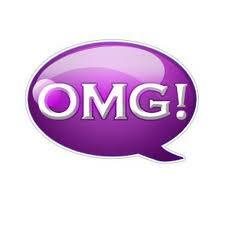 What follows is a hail storm of retweets that lit up Twitter. Drake follows back saying Pickens “just stunted on me heavy.” In other words, Drake said the Pickens did a classic show up and show out move. This is a classic case study of how social media has transformed the media landscape and why it’s even more important to have an engaging presence on more than just Facebook. If 84-year old T. Boone Pickens can be on Twitter with more than 46,000 followers than your brand MUST be on Twitter as well. And it’s not enough to just have a profile and Tweet a couple of times a week. Like Pickens, you have to seize opportunities where your brand can create conversations and remain relevant to your audience. 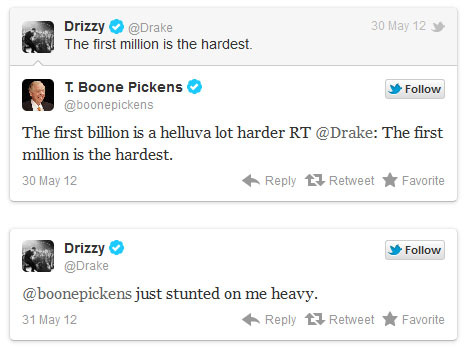 Now all of Drake’s 7.5 million followers, who are primarily Millennials, now know who Pickens is if they didn’t before. Talk about branding.